Designed for maximum insulation, the unique design of the Slumbertrack Energy Saving Sidetrack System provides a thermal performance rating up to five times greater than a standard single pane window. Multiple insulation barriers on this cell shade. 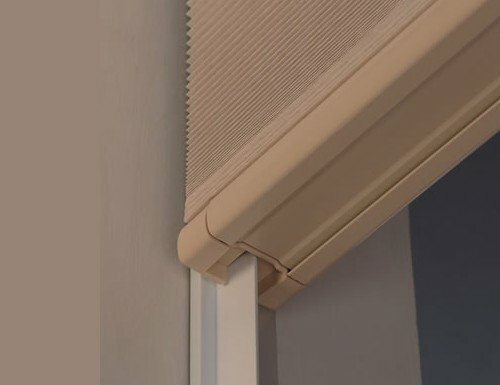 Sidetracks on each side of the shade seal the edges of the shades while a foam seal between the headrail and the top of the window frame minimize any heat loss saving energy. 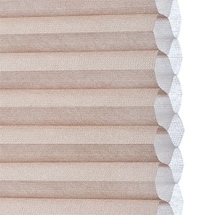 Slumbertrack cellular shades are manufactured for inside and shallow mount installation only. The Slumbertrack shade can be ordered in Translucent or Blackout Double Cell. Upgrades for the Translucent include standard corded, continuous cord loop, cordless lift, cordless top down / bottom up, or corded top down / bottom up. Upgrades for the Blackout include standard corded, continuous cord loop or corded top down / bottom up. Standard Corded is operated with a specified left or right lift cord. Continuous Cord Loop is designed and recommended for easy lift for larger shades. Cordless lift is a hidden control system that enables the rails to move with a touch of a finger, recommended for child safety. Cordless top down / bottom up features two moving rails allowing the blind to cover the entire opening offering complete privacy, pushing the blind from the top-down to offer natural light at the top (open) and privacy on the bottom or raising the blind all the way to the top for full clearance. Standard corded top down / bottom up are made with two operating cords - one on the left and one on the right of the shade. One will lower the middle rail and the other will raise the bottom. This product provides insulation with the use of a sidetrack that seals the gaps between the window frame and fabric, increasing the privacy and room darkening in a room. 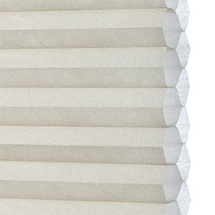 The removable white or tan sidetracks are attached to the inside of the window frame with double stick tape and magnets. There is a fuzzy seal that helps fill the gap between the head rail and the window frame. Fabric: Ordered width minus 1"
Head Rail: Ordered width minus 13/16"
Bottom Rail: Ordered width minus 13/16"
Side Track: Ordered width minus 1/8"
The widest width of the window cannot exceed the narrowest by more than 1/4". ComforTrack side tracks are attached with double stick tapes and magnets. Tracks can be removed for cleaning. W: 19" 20" 21" 22" 23" 24" 25" 26" 27" 28" 29" 30" 31" 32" 33" 34" 35" 36" 37" 38" 39" 40" 41" 42" 43" 44" 45" 46" 47" 48" 49" 50" 51" 52" 53" 54" 55" 56" 57" 58" 59" 60" 61" 62" 63" 64" 65" 66" 67" 68" 69" 70" 71" 72" 73" 74" 75" 76" 77" 78" 79" 80" 81" 82" 83" 84" 85" 86" 87" 88" 89" 90" 91" 92" 93" 94" 95" 96" 0/0"1/8"1/4"3/8"1/2"5/8"3/4"7/8" H: 12" 13" 14" 15" 16" 17" 18" 19" 20" 21" 22" 23" 24" 25" 26" 27" 28" 29" 30" 31" 32" 33" 34" 35" 36" 37" 38" 39" 40" 41" 42" 43" 44" 45" 46" 47" 48" 49" 50" 51" 52" 53" 54" 55" 56" 57" 58" 59" 60" 61" 62" 63" 64" 65" 66" 67" 68" 69" 70" 71" 72" 73" 74" 75" 76" 77" 78" 79" 80" 81" 82" 83" 84" 85" 86" 87" 88" 89" 90" 91" 92" 93" 94" 95" 96" 0/0"1/8"1/4"3/8"1/2"5/8"3/4"7/8"
What is the R value of the ComforTrack 3/8" blind? These manufactures no longer grade on R- Values. The last testing though and for the light filtering comfortrack shades it was a 6.0 r- rating. How well does the shade material hold up to hot summers and direct sunlight with regard to becoming dried out or fading. 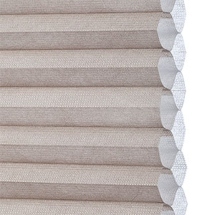 This particular blind is one of our more popular products. The ComforTrack cellular shade has been tested to withstand the elements without fading, it has the sidetrack insulation system to seal all the gaps between the fabric edge and window frame. The cellular shades have superior strength unaffected by heat, in addition to the superior insulation, they eliminate virtually 100% of the ultraviolet light that destroys the texture and color of your valuable home furnishings - yet ours never fade. 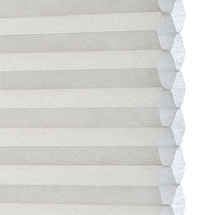 Our ComforTrack cellular shades are durable, washable, and dust resistant. 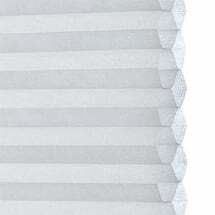 Can these blinds be used with slider windows? The ComforTrack Cell Shades can be mounted on any window with at least 2 inches of window frame depth and must be mounted inside the window frame. The problem with a sliding door is as with any horizontal blind or shade is the amount they gather at the top of the window frame. With the height of a sliding door there would be several inches of blinds that may interfere with taller people. For this reason we wouldn't recommend the ComforTrack shades. We are so impressed. The shade does everything it's supposed to and the installation took less than an hour. It rises and falls easily (manually) and it does indeed reduce exterior sound. It's not soundproof, and it's not supposed to be, but it really helped. Highly recommended! The website made ordering the shades very simple and they arrived promptly.<br>Installation was straightforward with the final result looking great.<br>Nice product that I would recommend to others. The website made ordering the shades very simple and they arrived promptly. Installation was straightforward with the final result looking great. Nice product that I would recommend to others. The blinds are great. They keep out the cold and keep out the heat. They look very nice. They are hard to snap into the bracket, however. I would suggest a modification in which you make them easier to snap in but then have a locking mechanism to keep them from falling out of the bracket. This is the 4th set of blinds I have install. This is the 4th set of blinds I have install. I have had to manually "adjust" the mounting hardware on 3 out of the 4. The product is easy to install once you understand how to click the blind into the brackets. The product is easy to install once you understand how to click the blind into the brackets. Product appears to be good quality and functions well with the side rails. I would order from Blind Chalet again. Choose the color of the ComforTrack sidetracks. Available in either white or brown. Attached to the sides of the window frame.